Omron's unique quality philosophy of quantitatively grasping and controlling quality. To meet the requirements of the marketplace such as for miniaturization, weight reduction, and use environment expansion, conditions required for design and production become strict and the quality control to satisfy the conditions becomes difficult at manufacturing sites such as automobile industry where high quality is demanded. As a measure to address these requirements, it is indispensable to establish a quality control system complying with the global quality standard ISO/TS16949.In addition, the quality control based on the same global standards is required not only at the mother factory but also at satellite factories including overseas factories. By realizing the requirements at a minimum cost, the competitive advantage in the market can be maintained while the world's factories aim to meet the same standards, and perform operation management to maintain the standards. To meet such environmental changes, it has become important to quantitatively control quality based on international standards typified by IPC-A-610 instead of relying on qualitative management techniques that tend to depend on know-how and skills in the soldering process. The basic inspection concept in the solder joint inspection is called SJI in Omron. The appearance of conditions where electrode leads of a component are soldered to the substrate land in the PC board implementation process shows the joint quality. 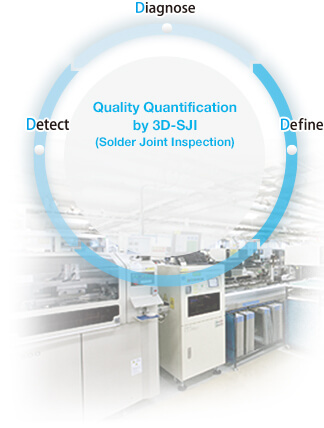 The solder joint inspection based on the SJI concept means the inspection of "solder joint reliability". A highly reliable solder joint is to meet the conditions of "(1) at the correct position, (2) in the right posture of electrode leads and components and (3) the solder shape is formed. "Omron has realized the 3D-SJI that can accurately grasp the solder shape. 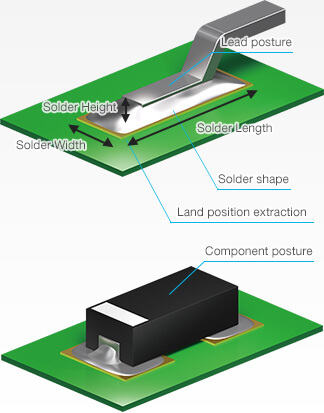 The figures below show examples of defects in which some leads are not bonded with the solder. In Fig. 1, the solder bonding defect can be detected by detecting the height of the leads. However, in Fig. 2, the height of the leads is normal, so this fault cannot be detected by the inspection of lead height only. 3D-SJI inspects solder shapes, making it possible to detect such a bottom-bonding defect in which the height of the leads shows no change. By using the component height data, stable programs can be created without depending on human capabilities. Soldering inspection that is not affected by the component layouts and color variations can be performed. Improvement cycle contributing to the creation of high-quality products. 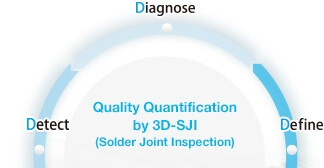 The solder quality control quantified by 3D-SJI realizes highly reliable solder. Realizes the quality control to create high-quality products. Ensures restriction-free design to meet the market needs for miniaturization and weight reduction. Initiatives for quality control based on the same standards between mother and satellite factories.